So with half a pig's head in the deep freeze and the need to free up some space, I decided to make some head cheese. It seemed like the perfect dish for fall, but I really wanted to try something different from my usual recipe from the River Cottage Cookbook. 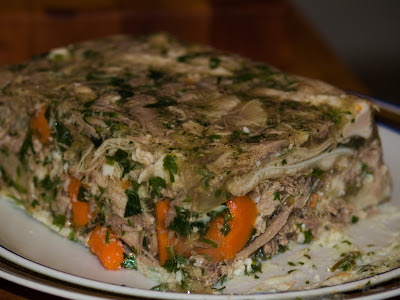 So I decided to try a riff on the head cheese in the book Odd Bits by Jennifer Mclagan. If you're looking for a book to get you started on cooking offal, I would recommend her book above any other. She also wrote two prior books, Bones and Fat, so you know she's versed in making the most out of the obscure and oft-forgotten pieces of the animal. As an aside, if you're looking for a more advanced book on offal, I would recommend The Fifth Quarter by Anissa Helou. But if you just want a regular cook book with some exciting recipes on offal, my favorite remains The River Cottage. Anyway, Jennifer Mclagan's book is a great way to get into offal, starting with some basic, crowd-pleaseing recipes and not diving right into the freakfest of lips and spleens. She has two recipes for head cheese, "head cheese for the unconvinced," and "advanced head cheese." What I found interesting about her "head cheese for the unconvinced," is that it had lots of chunks of carrots and herbs in it. The basic recipe is textbook head cheese. Boil head for hours, add stock vegetables and boil for another hour or two. Remove head to cool, and strain stock. Then while you pick the meat, skin, and ear from the head, let the stock boil down to a thick jelly that will set up when the meat is cooled. But what makes this recipe unique is a few fresh chopped carrots added to the stock (as the original stock carrots would have boiled to mushy abandon during the hour+ simmer). Then, as the meat and stock cools, you mix in the meat, carrots, and fresh herbs. Then top up with the jelly-rich stock to set in a beautiful mosaic when it cools. So if you don't like quivering, jelly-jiggling foods, you won't like this. But if you like head cheese, I found Jennifer's recipe to be really nice. The carrots and the herbs made it taste incredibly fresh and almost...light. Can boiled pig's head really be "light?" It almost tasted like a summer-version of head cheese, if that makes sense.